University of California Press, 9780520289277, 352pp. This provocative collection showcases the work of emerging and established sociologists in the fields of sexuality and gender studies as they reflect on what it means to develop, practice, and teach queer methods. Located within the critical conversation about the possibilities and challenges of utilizing insights from humanistic queer epistemologies in social scientific research, Other, Please Specify presents to a new generation of researchers an array of experiences, insights, and approaches, revealing the power of investigations of the social world. With contributions from sociologists who have helped define queer studies and who use a range of interpretative and statistical methods, this volume offers methodological advice and practical strategies in research design and execution, all with the intent of getting queer research off the ground and building a collaborative community within this emerging subfield. D'Lane Compton is Associate Professor of Sociology at the University of New Orleans. 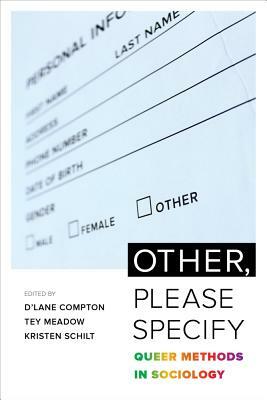 Compton is the coauthor of How Identities, Stereotypes, and Inequalities Matter through Gender Studies and a contributor to several volumes, including the International Handbook on the Demography of Sexuality. Tey Meadow is Assistant Professor of Sociology at Columbia University. Meadow is the author of Trans Kids: Being Gendered in the Twenty-First Century. Kristen Schilt is Associate Professor of Sociology at the University of Chicago. She is the author of Just One of the Guys? : Transgender Men and the Persistence of Gender Inequality, and her work has appeared in journals such as Gender & Society and the Annual Review of Sociology.